According to the great trove of knowledge that is Google, today is Santa’s List Day! 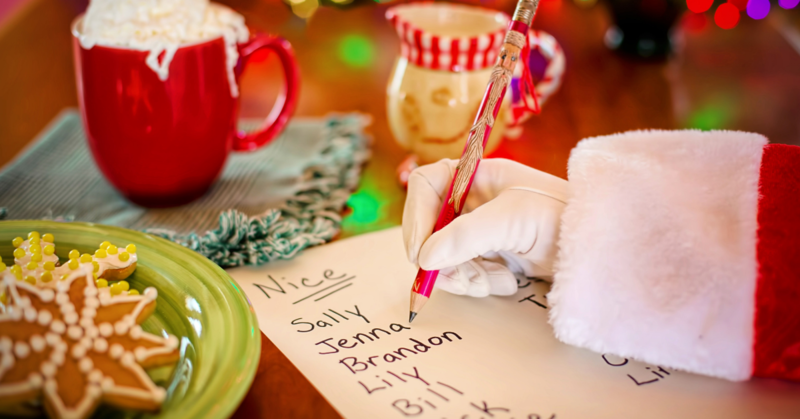 That means it’s…time to make your list for Santa? Santa’s day to check and see if you’ve been naughty or nice? Something completely unrelated to Christmas, like the day that Santa makes his grocery list for Mrs. Clause? But either way, that’s what today is! Personally, I’m going to go with the first option. After all, I love asking for stuff. It’s so much easier than the boring alternative of (1) seeing something that I want (2) checking my bank statement, and (3) realizing that whatever it is ain’t gonna’ happen. Unlike my AmEx, Santa can make things happen. I know he can. I’ve seen the Mercedes commercials. In all seriousness, let us know if there’s anything we can do to help make your Christmas dreams come true. More importantly, though, go give your family and friends a hug. Put a dollar in the Salvation Army kettle. Sit down with a glass of egg nog and admire the tree you spent all day decorating. Go make the most of this Christmas season. That’s what the holidays are really about…not shiny cars with giant red bows. However, if you want to ask Santa for a Porsche and Patek Phillipe, I won’t judge. After all, today is the day for those requests.